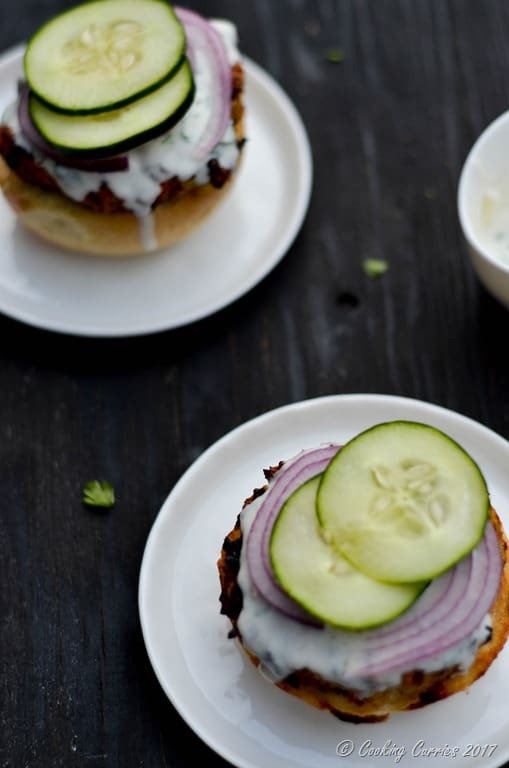 Chicken burgers loaded with tandoori spice, smothered with a cooling yogurt sauce and some crisp onions, cucumbers and tomatoes for some crunch and flavor, this will be your go-to burger for grill time, for everyday dinner and parties alike! Grilling or barbequing at home was a concept alien to me till I came here to the US. When we bought our own home and moved in here 6 years ago, our very close friends gifted us with a grill as a housewarming gift. At first, all we grilled was corn, skewered vegetables and store bought burgers. It was still a lot of fun and a lot of it was delicious too. But as years went by, I started experimenting with recipes for the grill. I would still leave the actual grilling to the husband, as it is one time, I don’t have to stand by the stove and cook. I can sit by the side and enjoy my chilled beer or glass of wine. You know what I mean, right! We started grilling chicken, prawns, made several different types of burgers from scratch, pizzas, naan pizzas and even dessert! Summer time, suddenly, opened up a whole new avenue for creativity. And plus, the kiddo loves it when we stay outside and grill. That way he gets to play out and get to do things and sometimes even “help” us with the grilling. 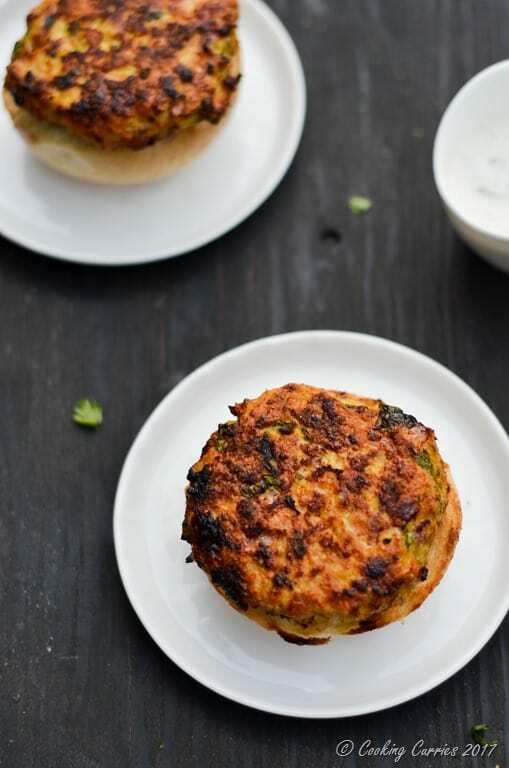 These Tandoori Chicken burgers is a favorite in our household. I buy pre-ground organic chicken from our local store here and marinate it with the tandoori spices for 20-30 minutes. It doesn’t need to sit for any longer than that as it is not a piece of chicken or meat for the flavors to really get absorbed. 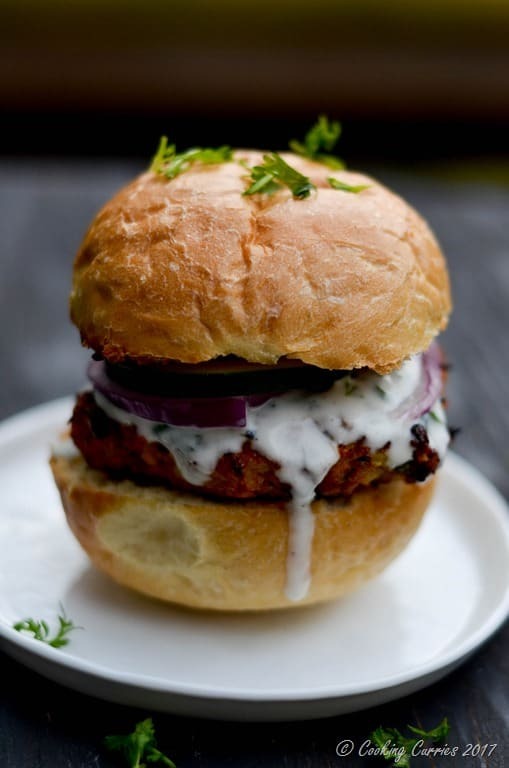 Then we grill it and our favorite bread and top the burgers with a quick yogurt sauce made fresh then and there. 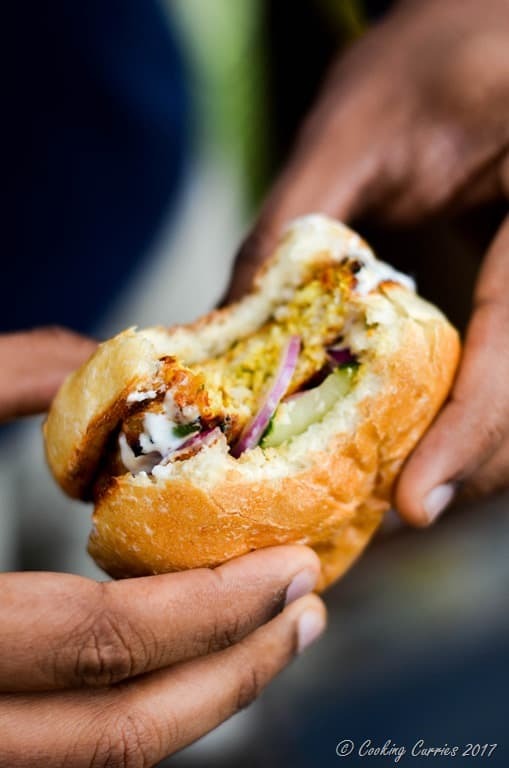 Some fresh veggies for a crunch and your delicious Tandoori Chicken Burger is good to go! This is also a great recipe to make for a crowd! I bet your guests will be impressed and will ask for more, so just plan for more than one per person Pair it with an ice cold beer and it will be the best dinner party you’ve ever thrown! 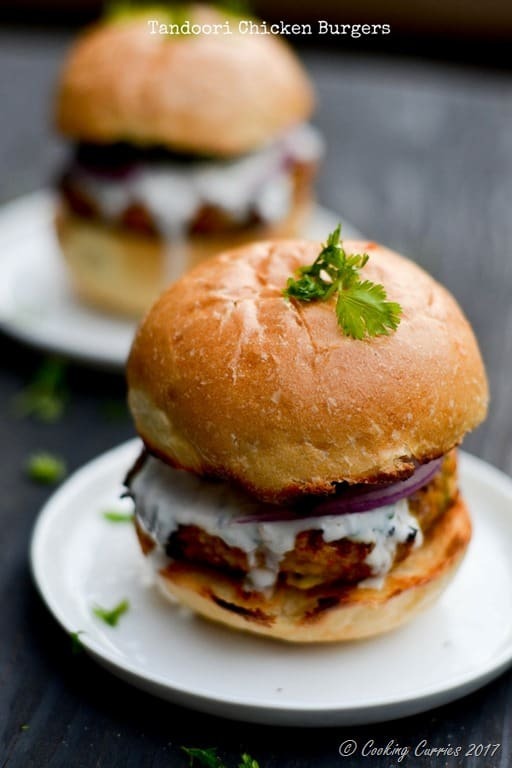 Chicken burgers loaded with tandoori spice, smothered with a cooling yogurt sauce and some crisp onions, cucumbers and tomatoes for some crunch and flavor, this will be you go-to burger for grill time, for everyday dinner and parties alike! Mix the ground chicken with all the other ingredients and set aside for 15-20 minutes. Divide into 4 equal portions and form patties about 4-5 inches in diameter. 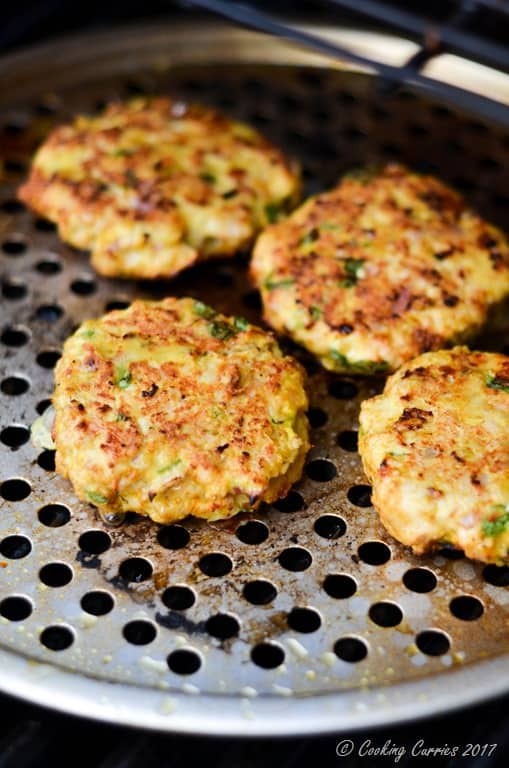 Fire up the grill and grill the chicken burger patties on medium high heat for about 5-6 minutes on each side till cooked all the way through. Use a meat thermometer to check - it should be 165F inside the center of the burger patty. 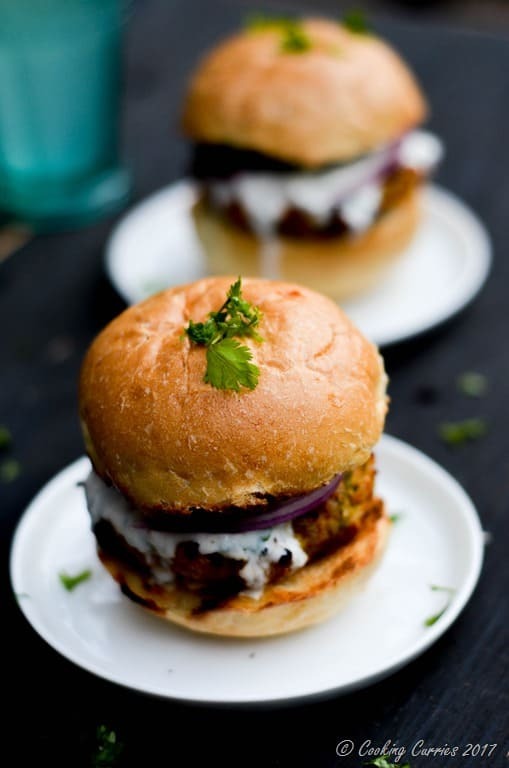 Pat some butter on each of the burger bun slices and grill them till they are crispy. 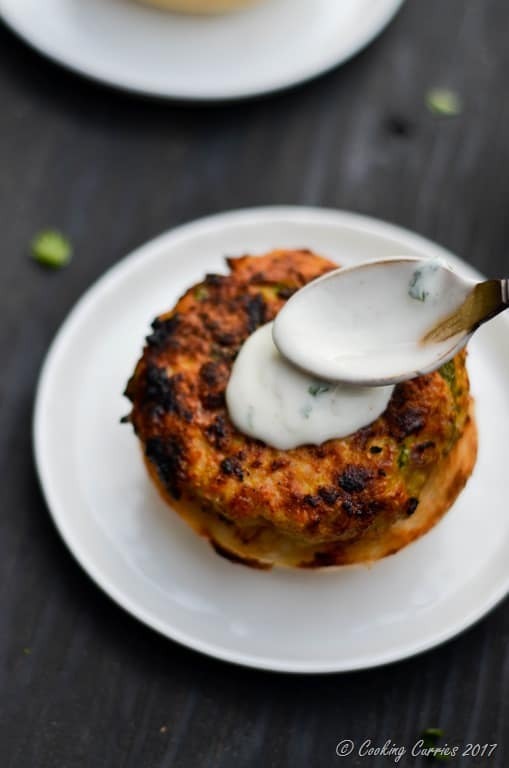 Spread some yogurt sauce on the bottom half of the bun. Place the chicken burger patty on top of it. Spread some more sauce. Top with onion, cucumber and tomato slices. Top with the top half of the burger bun and enjoy right away! I tried this recipe and loved it . Burgers were super yummy and everyone at home loved it. Definitely making it again. Thank you Radhika! So glad everyone loved it! ❤️?